8/22/2005: Updated Travelogues section: Gold Seal. 8/22/2005: Updated Travelogues section: Babies, Upgrades, and 'Round the Horn. 6/22/2005: Updated Travelogues section: I've earned my HS-125 type rating. 6/22/2005: Updated Travelogues section: Added Simuflite Training Journal. Cabin rental in Lake Lure, North Carolina, the perfect vacation destination for pilots who want to get away from it all! Welcome to my aviation website, by (a) pilot for pilots. I hope you enjoy these words and pictures. If you have any comments you can reach me at ryan@fergworld.com. Also, please be sure to sign my guestbook. What the %@#$ is this site about? A long time ago, I chose this domain name for a personal website, since my last name is Ferguson. That was then, this is now - and now is all about flying. "Fergworld" is meant to be tongue-in-cheek, lest you think I'm an egomaniac. So what will you find here? I self-publish articles on aviation - as a flight instructor I am very interested in sharing aviation with others. To that end I have constructed a Training & Reference section which contains lots of useful learning aids and training materials. I have also included pictures and reports of interesting aircraft, plus photos and stories about some of my cross-country flights and progress towards achieving various ratings and certificates. CFIs and instructor applicants might find my For Flight Instructors section helpful in their quest for memorizing and retaining knowledge. PIREPs contains reviews of various pilot equipment and gear. I try to keep these sections updated reasonably often, although I'll confess that my current schedule doesn't allow me to write as much as I'd like. My newest sections are my ATP Reference and Instructor's Corner. My nickname for the latter is the "Right Seat Peanut Gallery." About me: I hold an FAA Airline Transport Pilot certificate with an Airplane Multi-engine Land rating, and an HS-125 type rating. I have commercial privileges in single-engine airplanes and helicopters, and am instrument-rated in helicopters. (ATP-ME, CP-ASEL, CP-RH-IH.) I am also an FAA Gold Seal Certified Flight Instructor. 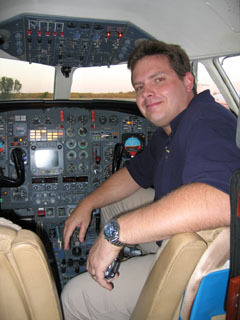 I am qualified to instruct in single-engine airplanes, multi-engine airplanes, and helicopters, and teach instruments in airplanes and helicopters. (CFI-ASE, CFI-AME, CFI-IA, CFI-RH-IH.) Additionally, I have an Advanced Ground Instructor certificate. As a side note, this site is completely free. You'll not find a single banner ad! (As of March 22nd, 2005, I have populated the site with a series of unobtrusive and relevant Google text ads in an attempt to defray some of the expenses of operating this website. I'd appreciate it if you'd click on a few links of interest.) You may freely copy and distribute all articles or photos you find on these pages, as long as you always provide a link to this website wherever you post the photo or article. Also, please have a look at my Pilot for Hire page. If you are looking for someone to ferry an aircraft or handle some other odd flying job, get in touch. © Copyright 2001-2005, Ryan Ferguson. All rights reserved.